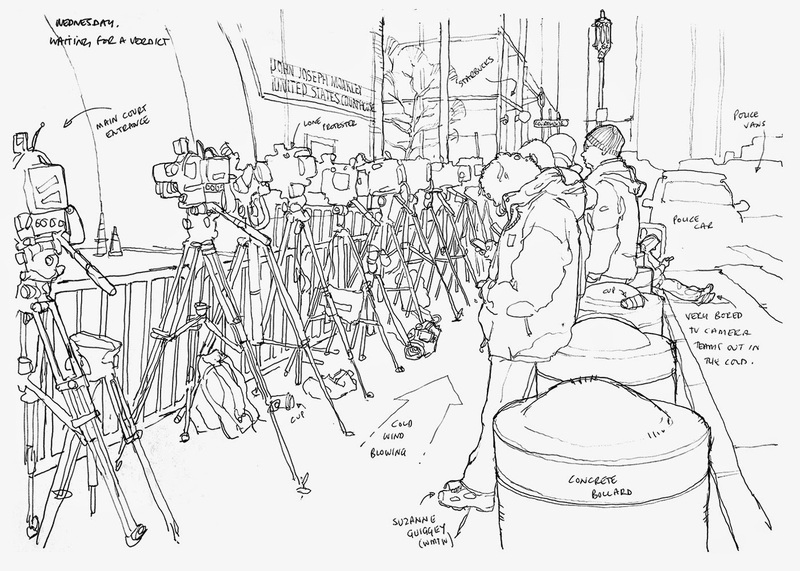 (Ed note: In the following, Richard provides USK his perspective as a sketcher - describing what it's like to be a journalist who draws the news. 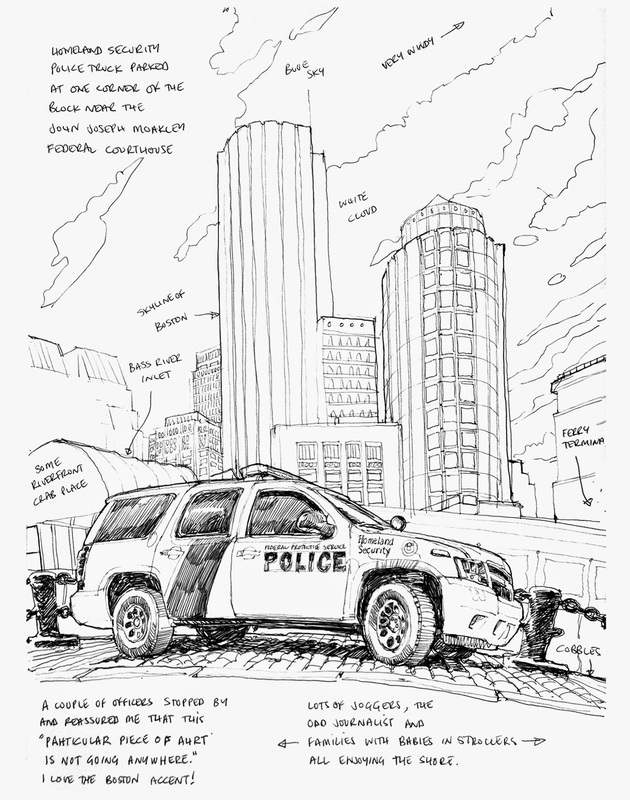 His first person narratives on the Washington Post blog bring greater depth to the story of the ongoing trial in Boston). 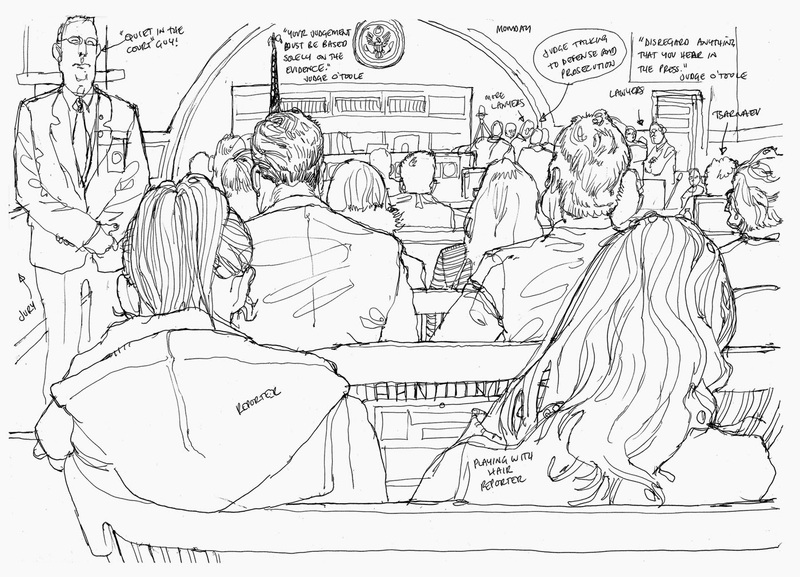 I have spent six days up in Boston urban sketching the death penalty trial of Dzhokhar Tsarnaev, the 2013 Boston Marathon bomber, on assignment for the Washington Post. This, as I am sure you can imagine, comes with numerous challenges. BACKGROUNDING: The first thing I did was visit and sketch the locations of both bombings to get a real world feel for the terrain. There really was not much to see at either location. GETTING IN: My success so far comes from arriving stupidly early and then being neck-achingly obsequious to all the lovely (in case they are reading) federal employees. I am generally one of the last to get in the court IF I am getting in at all. GETTING A SEAT: I generally end up in one back corner squeezing in beside a bunch of folks who were definitely NOT expecting any more visitors. I usually drop all of my pens, sketchpad, googly opera glasses, and binoculars in the gap between us. 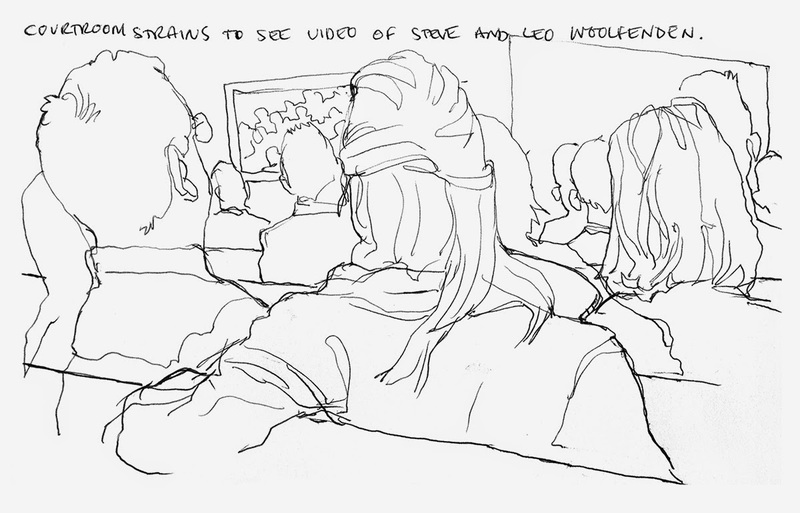 THE VIEW: My best seat so far has been about forty feet from the witness box and Tsarnaev himself, sixty from the judge. And between us are a sea of heads all wagging left and right trying to see past one another. It is like a game of whack-a-sketch. BINOCULARS: Yes indeed. I recommend this as a drawing exercise of utter misery when you are feeling overly happy. It is difficult, migraine inducing work, but it is generally the only choice I have. When a witness is on the stand forty feet away I lift the binoculars, memorize an eye shape, or a hair curl, or a nostril shape, then drop the binoculars and draw a line – and then repeat until hopefully a face appears. CRYING: Tears and binoculars are not a great combination. 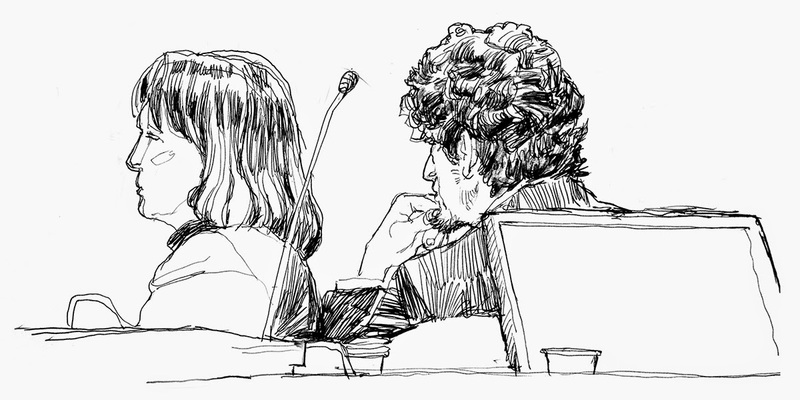 As I draw I am listening to the testimony of the witnesses. Partly because it is impossible not to, but also because I am waiting on those insightful, powerful quotes so I can add in as part of the sketch. 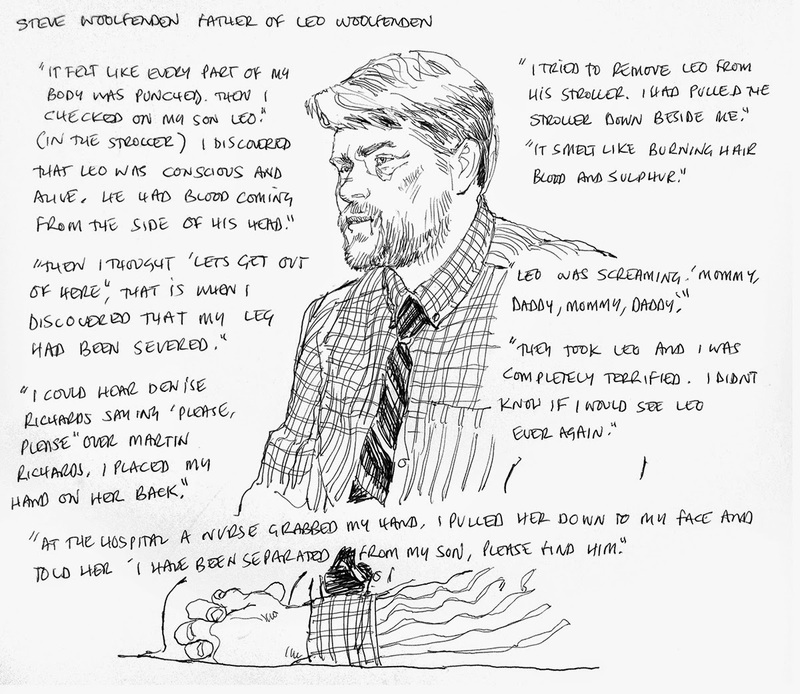 The horrifying testimony also has an emotional effect so at any second I can find myself writing or drawing through tears. 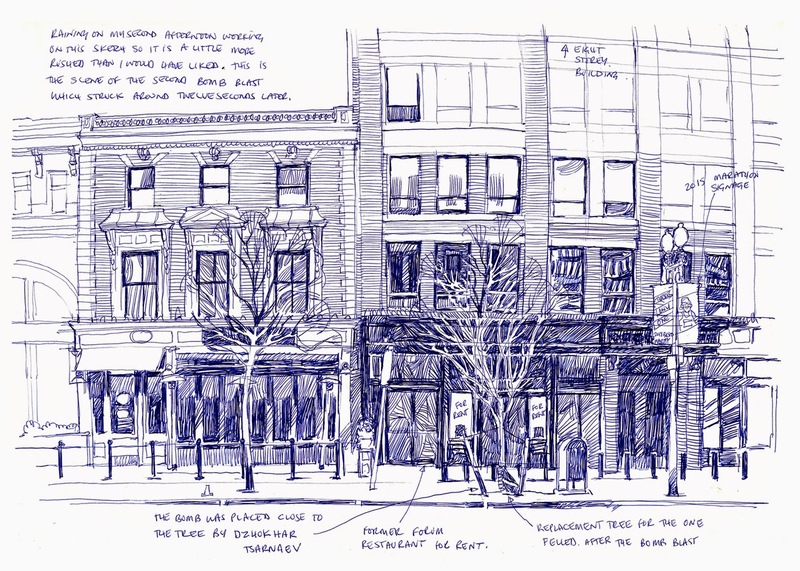 SKETCHING: I usually have three or four sketches on the go at any one time. One of the room in general, one of the witness stand, one of anything else going on, and one of Tsarnaev himself. 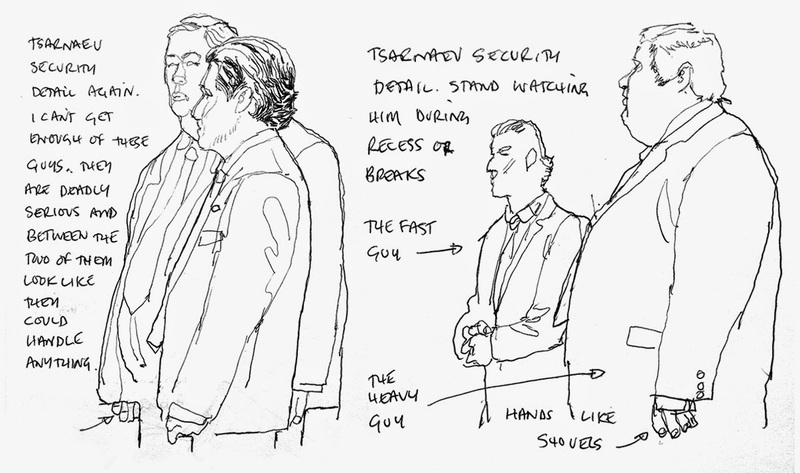 Tsarnaev generally keeps facing forward offering only a very slight oblique profile. But he will intermittently lean his head to the left to speak a few words to his lawyer. I keep one eye on this at all times ready to swing the binoculars in his direction in order to catch him. FILING: The court is a no photography zone with no internet. At lunch break I run out into the street, find a place to lay the art out on the ground and photograph it. Then I run the half block to Starbucks and snag a table. If I am feeling good I’ll buy a coffee rather than just pilfering their interweb. I upload and file the morning’s work leaving me just enough time to throw out my half drunk coffee and go right back into court again. I then repeat basically the same process for the afternoon session. THE AMBIANCE: Finally whenever I get a little down time I like to catch some of those strange little indoor and outdoor courtroom details, the protesters, the lawyers, the police or the media. I feel this gives the reader a little more feel for the oppressive nature of the whole thing. Rinse and repeat.